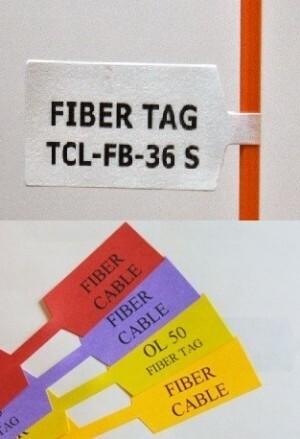 Our Optical fiber tags TCL-FB-36 labels use a simple and innovative design and can be printed on any standard office laser printer. Our own Technicians use these fiber labels in every project. We now have two types, weatherproof and standard type materials. Our standard white matte label sheet is our most popular and versatile material. It is a bright white face sheet with a permanent adhesive. The material produces excellent results when printed with a standard laser printer for indoor use only. Please note: Each TCL-FB-36W sheet contains 36 Labels. 10 sheets you will net 360 labels. Please note: Each TCL-FB-36S sheet contains 36 Labels. 10 sheets you will net 360 labels. This product is used by many industry professionals who need durable, long lasting, permanent sheet labels with the added protection of a self-laminating, polyester wrap. Cable labels are perfect for networking and telecom installations as well as medical and lab applications.